We're back with our Riverbottoms Remodel! The transformation of this entryway is huge, so make sure you watch the webisode to see how it changes! 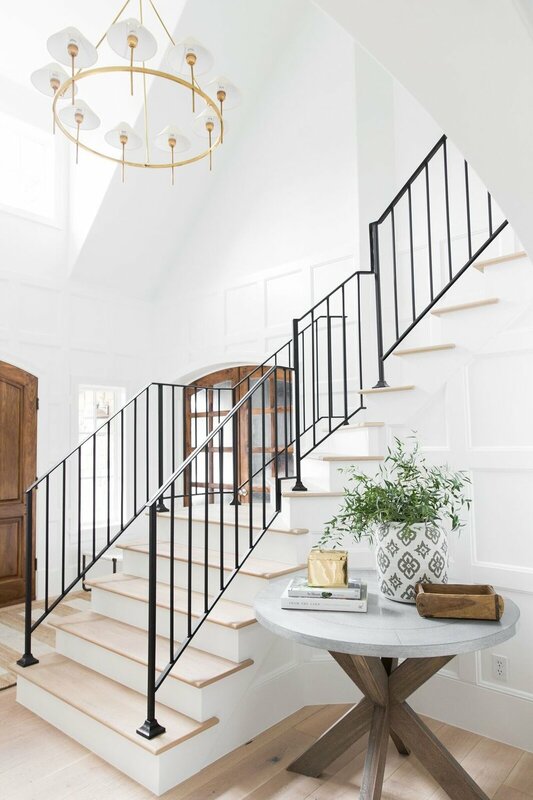 An entryway is the first thing guests (and family members) as they come into the home, so it's important to create a space that's welcoming. 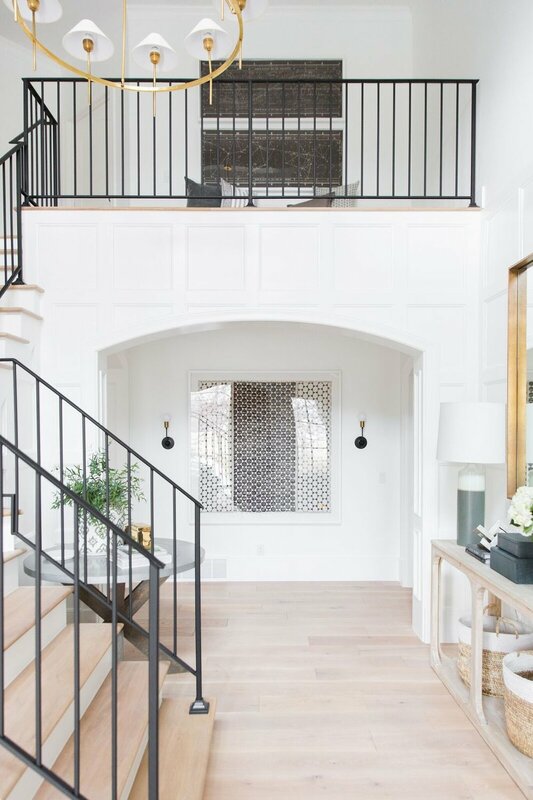 See more of the Riverbottoms Remodel by checking out the Living Room, Kitchen + Dining, Mudroom, Laundry Room, and Master Closet! The Milo Jute Rug is ideal for welcoming guests with its bold and earthy design. It's one of the modern pieces in this space that are versatile enough to work with traditional details—plus it's so soft! It's not "reversible" but we flipped it over and cut off the tag since they have dogs and kids and the durability of jute fits their lifestyle better. The staircase had the biggest transformation of them all. With a dated railing, it needed to be re-finished. 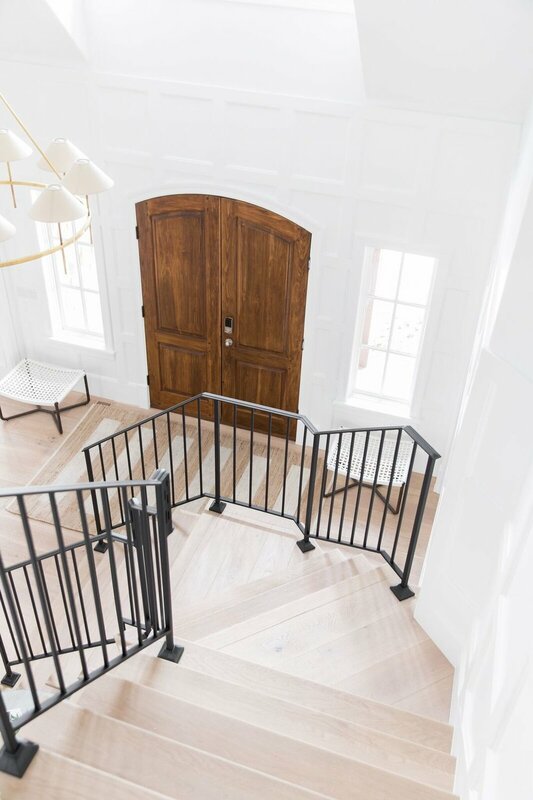 But we decided on installing a new iron railing that has a streamlined style that is new and refreshing, but still traditional. We carried the light flooring (Alta Vista Laguna from Hallmark Floors) all the way up the staircase. It's one of our favorite details! To create keep things from being too matchy-matchy, we used the Hackney Chandelier in brass that contrasts beautifully with the black railing and weathered top on the side table. The result is a textured space that is cohesive but collected, so it feels thought out but not like everything was purchased from the same place. Another beautiful detail is the vast vaulted ceilings, and grid pattern on the wall. 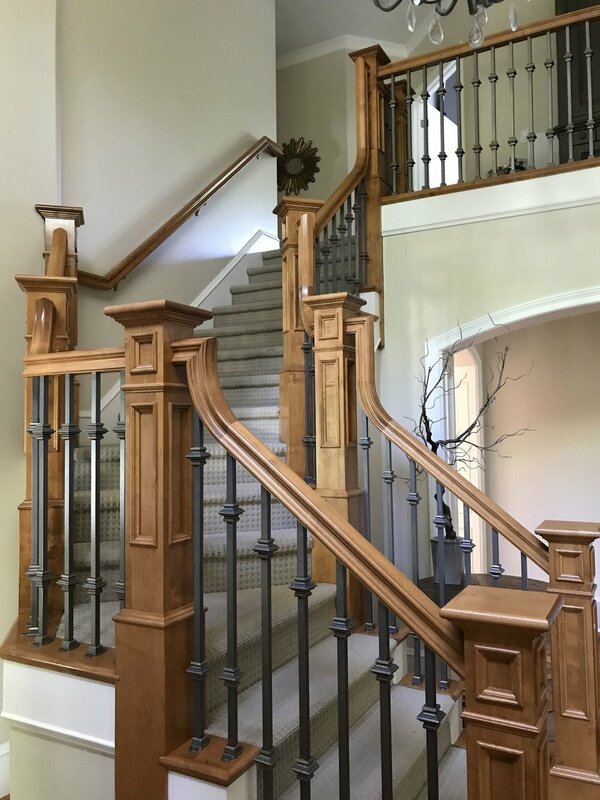 We used these to create dimension and character, with extra beading as a nod to the traditonal molding throughout the rest of the home. 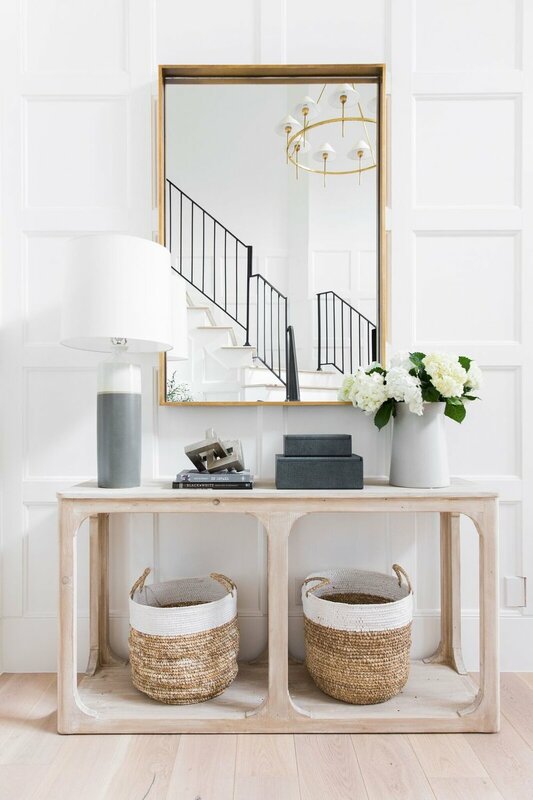 If you have the space for a console in your entryway you have to take advantage of it! 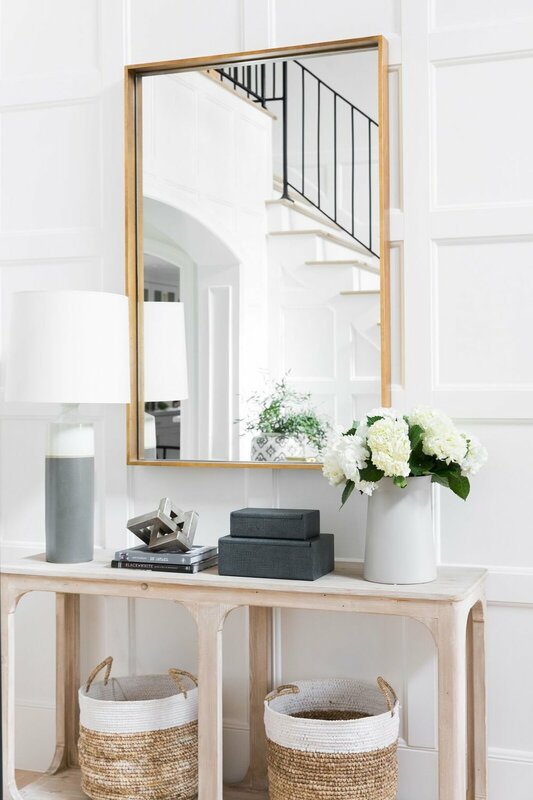 Not only does it look beautiful, but it's a place to store extra shoes, bags, and keys and to keep a mirror to check as you're going in and out of the home throughout the day. The natural oak in the Hollie Console is perfect when paired with the woven baskets, with white color blocks that keep everything feeling bright. The matte ivory and slate gray in the Amelia Lamp create a beautiful but subtle contrast. We grounded the setup by using the ivory Dove Vase on the right side of the console. Greenery is essential to any space that needs to be welcoming and bright. We filled the Floral Terra Cotta vase because it's oversized and plays in with the slate weathered top of the side table. We love this brick mold as a rustic addition to stack on decorative books. You could also use it as a catchall for your keys!